Today there is an internet-wide DONATION BOMB for BEN WOLVERTON who was in a tragic longboarding accident on April 3rd, 2013. Ben suffers from severe brain trauma, a cracked skull, broken pelvis and tail bone, burnt knees, bruised lungs, broken ear drums, road rash, and pneumonia. He was in a coma, but has recently awakened. His family has no insurance. Ben's treatments are already over $1,000,0000 and he will need extensive therapy as he relearns how to walk. 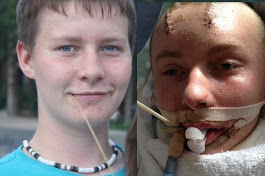 The aim of the bomb is to have people donate any amount of funds they to the Help Ben Walk Fund. Click here to discover other ways in which you can help. Have a great weekend and remember to count your blessings! The Donation Bomb is all over today!! Donated a few days ago. So tragic. I have a sixteen year old son myself. Sending lots of positive thoughts for his recovery. Wishing him and this donation bomb all the best. Wonderful idea. Your pictures caught me deeply in my heart. I've seen it on some other blogs. Wishing Ben and his family the best. Thanks for sharing your thoughts, guys. Like you, I'm hoping for the best for Ben and his family. The pictures tell a sad but potentially uplifting story. So true about counting our blessings. And being grateful for them all. Rachel, yes the writing community is awesome.